OUR FONDANT TRANSFORMS ORDINARY DESSERTS INTO EXTRAORDINARY WORKS OF ART. Formulated with professional chefs in mind, Mona Lisa's premium rolled fondant makes it a breeze to create colorful masterpieces! Made with high-quality, flavorful ingredients, our fondant complements and enhances the flavors in your desserts while adding visual pizzazz. It can be transformed into a wide variety of shapes and sizes, in original white or chocolate, or even tinted to make your own signature colors. Premium ingredients and unique formulation keep our rolled fondant pliable longer, allowing for extended working time with no cracking or tearing, even on shaped cakes. Our quality ingredients deliver bright white color without the use of the food color additive Titanium Dioxide. And our chocolate fondant is deep, rich brown. When exposed to excessively humid or dry conditions, our fondant stands its ground and does not become sticky, tacky or dry. Vacuum-sealed protection prevents fondant from drying out on edges and top, making our fondant 100% usable with no waste from unopened pails. Store rolled fondant at room temperature. Once opened, protect opened pouch of product by wrapping in plastic wrap or containing in zip top bag. Place wrapped fondant inside the original container and store at room temperature. 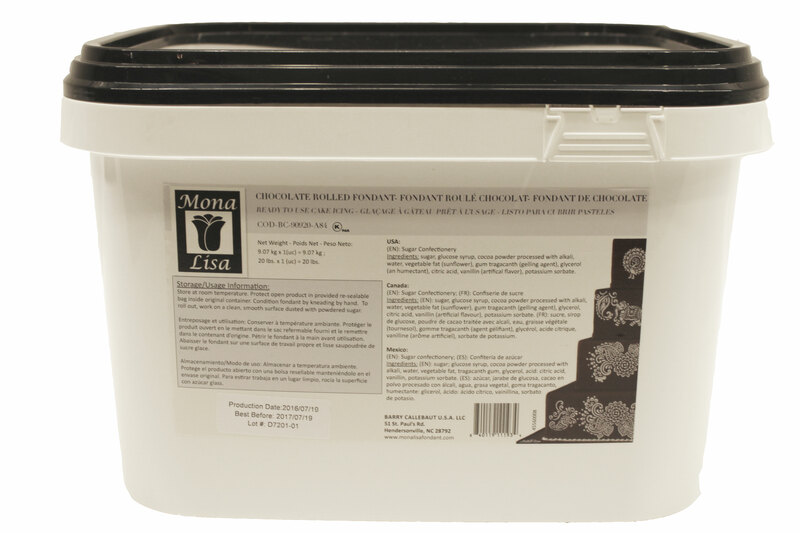 One 20-pound pail of Mona Lisa fondant will cover approximately five to six 3-tiered traditional wedding cakes. This chart is a guideline on how much fondant you will need to start with for your cake. Weights are based on a standard 4" (10cm) tall cake and a thickness of 1/8 (3mm).